While most cannabis breeding goes on in the Netherlands, this particular strain was developed by Dutch Passion in mountainous Switzerland, as a result of a cross between the Northern Lights #1 and an unknown Indica. A perfect pain reliever, sleeping aid and tranquilizer, which makes it a great choice also for the patients of medical marijuana. The plant doesn't grow high and stays compact, rather bushy, while creating magnificent buds with an earthy flavour. Small size makes it a perfect choice for home growers, which is yet another reason for using for medical purposes. 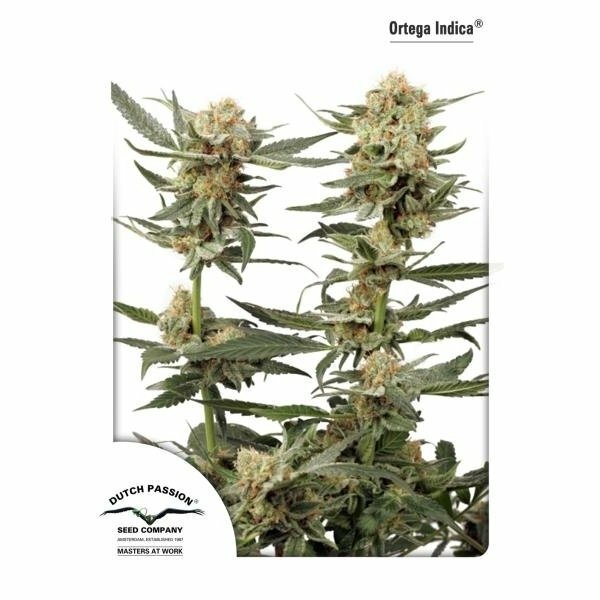 A relatively slow growing variety, with a 8 to 10 weeks flowering period. Due to their dwarf posture it can also perfectly well be used in guerrilla outdoor cultivation. Despite an extremely strong stone, Ortega Indica by Dutch Passion, at 15-17% THC and high CBD does not cause the "morning after" effect, i.e. no hangover! The flavour, as you might expect from an almost pure Indica, is quite rough, with a spicy aftertaste. One of the best strains for medical purposes among the Dutch Passion offering - great, intense Indica body stone and no heavy head the day after.